You are currently browsing the Dublin Event Guide weblog archives for June, 2011. If all goes well, the “Dublin Event Guide (for Free Events)” will be featured in the RTE1 programme “Capital D” on Thurs 30 June (19:00)!! This is a big milestone for the Dublin Event Guide and I would like to thank Nodlag H., a wonderful Dublin Event Guide reader, for making it possible. The piece about the Dublin Event Guide will be relatively short, but the programme is only about 20 minutes long, so having more than 25% of the full programme dedicated to this newsletter is just brilliant! It will be great to welcome many new readers and subscribers that found us through the TV programme and that join our Dublin Event Guide Community, but you know that your support is absolutely essential because the best way of letting people know is through word of mouth! This week’s Feel Good Slot video clip is a bit more reflective. It remind you that every person comes into our lives for a reason….and often leaves our lives again when the job is done. Have you met people along the way that had a BIG influence on you, but after a while they disappeared again? Maybe you even had to remove them from your life? Don’t stress over it! They came for a reason! Books for lower prices than Amazon, sent to you with no postage cost, individually packed and within 48 hours. And with every book you buy – after clicking on the link below, you directly help the Dublin Event Guide (for Free Events)! BTW: If you think that I make money from advertisement because you see a few ads, then please note that only if you click on the link in this newletter/e-zine when you, for example, order books from bookdepository, a (very) small amount (EUR 0.30 on average!) will be paid to me. If you don’t BUY, I get nothing and if you don’t click on the link here to start your purchase, I don’t get anything either. And it is similar for most of the other ads. This Event Guide is sponsored by Esme E, Cliodhna D, Brian L, Padraig S, Kathie S, Orla niF, Jef B, Susanna N, Kate C, Nicola J, Claus Sch, Gordon S, Jeanne M, Fiona O’C, Marta M, Angela C, Isabelle F, Saundra S, Meisoon N, Ruth F, Valerie McN, Estelle O, Aoife M, Mairin M, Fionán O’L, Maeve L, Blaithin O’D, Ciara D, Mike G, Andrej G, Deirdre R, Vanessa O’L, Chris McK, Frank B, Dolores P, Cornelia K, Cathy A, Orla C, Kevin McC, Steph G, Wanda J, Siv M-J, Niamh niS, Gwen H, Jasmin T, Ian O, Eva C, Will P, Gráinne P, Caroline R, Elizabeth F, Suzanne B, Adele G, Jack C, Keeva H, Mairead MacM, Niamh G, Siobhan C, Jackie B, Penny O’D, Kathryn K, Aidan G, Ciara G, Deirdre L, Stephen D, Mary Q, Donald P, Aidan C, Julia Sch, Isak R-B, Sharon O’S, Brajan V, Nancy O’D, Zelie McG, Niamh K, Jennie R, Semin S, Gavin H, David G, Becky B, Emer niB, Niamh N, Ciaran H, Louis M, Gerard Ph, Monika E, Mark K, James O’H, Pere SC, Marsha D, Sarah McC, Patrick O’C, Sandra R, Christoph Sch, Deirdre O’B, Ellen C, Eimear O’F, Luna B, Leslie C, Elaine McH, Elva O’G, Deirdre G, Martin O’M, Maeve C, Ciara O’C, Sarah D, Patrick C, John O’R, Brian C, Brian R, Caroline C, Elaina O’N, Eilis C, Sandra R, Geraldine D, Nora W, Rachel M, Renata V, Carine S, Ruairi O’G, Donna D, Clare D, Tuna Y, Lisa S-O’G, Aga G, Anna B, Ian S, Joan W, Brian R, Bear N, Sebastian B, Tina M, Will McA, Siobhan H, Soeren G, Sheila McC, Regina Q, Marc F, Kieran O’C, Alan S, Orla K, Mike G, David N, Atri B, Damian L, Orna McE, Colm K, Grainne+Kieran C, Paul A, Cathy A, Damien McK, Sharon O’S, Malachy B, Eily O’C, Bridin McI, George K, Fergus O’C, Caitriona F, Marie N, Sarah M, Kalle R, Mervyn M, Thomas D, Anna-Lena F, Veronica F, Filippo G, Eimear McG, Marion K, Susan D, Patricia O’N, Darren B, Jekaterina O, Fergus G, Ailbhe H, Rainey D-G, Johan S, Gareth S, Evan P, Therese O’R, Rebecca M, Eva C, Ming-jia Y, Niamh S, Nikodem R, Padraig K, Stephanie W, Sarah Ann H, Ailis F, Fiona M, Nazim MG, Maureen P, Alda G, Pia O, Pauline R, Patrick Th, Brendan McC, Deirdre C, Patricia F, Aine G, Linda M, Hans W, Joan K, Ailish L, Tammy W, Darren B, Sarah M, Sophie P, Alessia R, Fiona O’R, Pia O, Paul H, Paul M, Stephanie C, Catherine G, Linda C, Anna O’D, Karen K, Eilis C, Robin S, Olwyn F, Rainey D-G, Gordon S, Irene H, Ellen B, Joe O’D, Geraldine D, Brian L, David L, Mary K, Alison P, Mary McK, James O’C, Joe C, Alan G, Svatka V, Zelie McG, Sean S, Claudia D, Christian K, Cathy G, Barbara Q-B, Anto K, Maria F, Tom D, Orlaith niB, Pauline R, Marta T, Anna O, Stephen Q, Kiera M, Claire McM, Corina R, Sylvie S-M, Julie H-C, Rebecca T, Arthur D, Laura B, Brenda McP, Fiona D, Keeva H, Nihar B, Brendan M, Donna M, Arthur D, Selina McC, Katrin H, Gil H, Padraig P, Melina Z, Cathy A, Thomond C, Raymond R, Nicola R and Noemi V, Ciaran W, Isabel F, Brendan M , Tom D, Luke, Monika K, Janine McK, Tom D, Sebastian B, Paul T, Anne G, Marc F, Camelia P, Nicola B, Ciaran H, Ryan M, Ellen M, Gerard C and www.flamencoindalo.com (A group that supports and promotes the art of Flamenco in Ireland. ), www.olliart.com (An art curator and seller of art to businesses and private collectors. ), www.thepaulkanegallery.com (A great Art Gallery, located at 6 Merrion Square, which supports contemporary Irish artists.) and www.a1computers.ie in Dun Laoghaire/Cabinteely (…who repair computers, printers and sort out Internet problems fast and who sell computers, laptops and lo w priced printer cartridges). The main sponsor is www.kravmagaireland.com, the self-defence training centre for everyone, which provides regular 12-week or 2-day self-defence training courses for beginners. On Sunday there is more of the Docklands Summer Festival, then there is Urban Living and Pedal in the Park. So for me it is probably Urban Living. Luckily there are a few less events during the week, I couldn’t keep up SUCH a busy schedule for a whole week! ;-) But have a look on Wednesday at the Nationl College of Ireland events about Cloud Computing. Then there is the EYP Summer Party on Thursday and obviously the highlight on Thursday (hopefully! ;-) ) the Capital D programme which features the Dublin Event Guide! Route 66 is a social night of Swing dancing that takes place every Wednesday in the Turk’s Head. There’s an easy drop-in lesson for beginners from 20:00 to 20:45, followed by social dancing until 23:00 (or sometimes later!) featuring all the best Swing music from the 1920s to today, including everything from Duke Ellington to Peggy Lee, from Glenn Miller to Ella Fitzgerald, from Frank Sinatra to even Michael Bublé! Admission is EUR 8 and you can buy your ticket at the door. See www.boogiebeatswing.com for more info. On Wed 06 July, Route 66 will be celebrating its 7th anniversary. On top of that Jamie, the organiser/teacher/DJ, will be celebrating 10 years of teaching Swing in Dublin. If you’d like to join their Swingin’ celebrations on that day, enter this week’s competition! Jamie was super generous and made 7 (SEVEN!) pairs of tickets available for the big night on 06 July (one pair for each of their seven years ;-) ). Thanks! To enter the draw, send a mail to dublineventguide@gmail.com with ROUTE66 in the subject line and your name and mobile phone number in the body of the mail. Your mail has to be with me by 15:00 on 04 July. 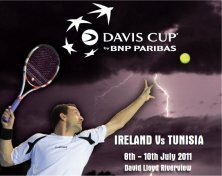 matches "Ireland vs. Tunisia" will take place in David Lloyd Riverview, Clonskeagh, Dublin 4 from 8-10 July 2011. On Fridays at 19:30, the National Wax Museum Plus in association with Alive-O Productions present “Waxing Lyrical” – a rib-tickling alternative evening comedy tour of the wax museum. “What happens when you have two rival ‘Tour Guides’ but only one job? The heat is on, and in a wax museum, that could spell trouble! We join these hilarious ‘guides’ as they endeavour to take us, the audience, on a side-splitting alternative tour of the museum. We’ll indulge in their unique take on history, as they relish in spinning colourful yarns about the waxen characters we encounter. In the show, we will get to experience two tours, followed by an exciting plot twist finale, brought to a head by our loveable rule breaking guides.” (This is an over 16s event, due to the ‘colourful’ nature of the guides.) I know some of the team behind this comedy and expect that it is a lot of fun. The show will take place at 19:30 at the National Wax Museum Plus, Foster Place, Temple Bar, Dublin 2. The show lasts 1 hr and tickets are EUR 15 and are available from www.entertainment.ie/wax or on the door. Alive-O now have made one pair of tickets available tonight’s performance and the winner is Orlaith Ni Bhroin. Congrats! You might have heard or read it already, but in case you missed it: This year’s winner of the Street Performance World Championship is …. The Space Cowboy!! For the third time this sword swallower, juggler, performer, dare devil, uni-cycle master and show man has won the World Championship and I detected a certain trend-setting effect: Stunts and acts that were performed by the Space Cowboy already years ago are now picked up by many other performers. The Street Performance Wold Championship was a brilliant event again and I am already looking forward to next year’s event. The event had lost its main sponsor last year and was this year sponsor-less, but it had no impact on the quality of the festival, so big praise for the organisers. One thing puzzled me a bit, though: I understood that the “Where’s Wally?” record attempt was a means to generate revenue for the festival through the sale of the costumes (And I would have fully supported that. ), but then I read in the festival brochure that the proceeds were going to a charity in Africa!? Certainly not a bad thing either, but I was a little confused. If you feel stressed about the fact that you were told lies, think of Santa and you will get over it. ;-) If you think Met Eireann is wrong, argue with them, not with me. (I have good reason to say that. ;-) ) Ohh, and I totally agree with you: I thought as well that summer was meant to come with sun and warm temperatures! One big problem are leaks: A lot of work has been done in the last years to fix and replace old water pipes and this year the massive amount of EUR 320m will be spent (in whole Ireland) on water infrastructure to reduce leakage (www.rte.ie/news/2011/0616/water.html), but loss of water through leaks in the public water supply system remains a serious issue. In the mid 90s up to 42% of water in Dublin was lost through leaks. This has been reduced to below 28% in 2007 (www.rte.ie/news/2007/0927/water.html) and even further since then, but with 510 mill ion litres of water being consumed in Dublin, a 1% change is still a huge 5 mill ion litres! The “Summer of Heritage” is back. Last year thousands of people visited various heritage sites across Dun Laoghaire -Rathdown and this year promises to be even better with an expanded programme featuring a range of events for adults and children alike, all of which are free to attend. The schedule includes tours and living history performances at the two magnificent stately homes, Cabinteely House and Marlay House. Tours of the stunning Celtic Oratory on Library Road and the Obelisk on Killiney Hill are back again and two new excursions have been added to the festival; The Dun Laoghaire Memorials Tour, which is a coastal visit to the numerous memorials around the town, including the Queen Victoria Fountain and the Crimean War Cannon. And a sightseeing tour along The Metals, a historic pathway that linked the quarry in Dalkey to the harbour in Dun Laoghaire is also new to the programme. Nature lovers will enjoy the viewing of sea birds at Coliemore Harbour in Dalkey with members of Birdwatch Ireland, as well as the nature walks around Dillons Park in Dalkey, Three Rock Mountain and a bat walk along the River Dodder. In order to beat an economic downturn not governments can help, but individuals are needed that take the initiative and create new markets and new opportunities for themselves and for their customers and hopefully employees. The Dublin Event Guide (for Free Events) will help you if you have recently started a company and if you could do with spreading the word. Being mentioned here and being seen by the 8000+ readers of the Dublin Event Guide should help to kick start something big for you. In return I expect you to tell your clients and friends about the Event Guide and once you have made a nice bit of money, a donation would be very much appreciated. ;-) (This offer is for start-ups in relatively early stages only. Established companies can contact me regarding very affordable advertisement options in the Dublin Event Guide.) If you want to promote your start-up/young company here for free, let me know: dublineventguide@gmail.com. Fiona Kelly told me about the new restaurant that she and her team opened only recently. It is a Fench-style Restaurant called “Brasserie Le Pont” and is located on the corner of Fitzwilliam Place and Leeson Street, very near to Leeson Street Bridge over the Grand Canal. Brasserie Le Pont is beautifully decorated and they are open first thing in the morning for coffee, throughout the day serving lunch and afternoon grazing plates and then for dinner from 17:30 (Tuesday to Saturday). On Fridays from 18:30, a French jazz band play upbeat and smooth French jazz, suitable for chilling out over after work drinks. In addition to the restaurant there is a Wine Bar section, there is a heated terrace and private dining areas are available. To celebrate the launch they are currently offering all customers a complimentary glass of prosecco when they come in for dinner. The pictures on the website promise a beautiful, sophisticated dining experience and Fiona and her team would love to welcome you to Brasserie Le Pont! The Ink Slingers Creative Writing Hour takes place every Friday at the Irish Writers’ Centre. It is a free creative writing session that is organised and led by the Centre’s voluntary arts administrators. The hour includes writing exercises and prompts to get ideas flowing. It is open to everyone and is suitable for all levels of experience. Sarah Griffin will be hosting the Ink Slingers throughout June. As part of the 16th Sustainable Living Festival (16-26 June) on Friday an day about Sustainable Tourism and Local Food Enterprise will take place. Food Tourism is an important element in the total tourism mix. Sustainable tourism is about making sure that tourists chose local food for boosting local economies and strengthening local communities. Establishing more local food enterprises as part of the tourism mix, while exploiting the country’s ‘green and hospitable’ image, are key to Ireland’s success as a “Food Island”. The afternoon programme starting at 14:00: Businesses and international tourism experts discuss the benefits of local food as part of the tourism mix. SJ McArdle will perform in Tower Records. Fri 24 June: 18:00-20:00 – Science Gallery, Pearse Street, TCD, Dublin 2.
www.sciencegallery.com/events/2011/06/dublin-city-science-tweetup Admission is free and everybody is welcome. “Buddhism and the Economic Crisis” is the title of a Public Meeting with Ken Jones, author of “The New Social Face of Buddhism”. The same speaker will lead a workshop entitled “Transforming self – Transforming society” on Saturday 25 June, 11:00-13:00 at the Central Hotel. This workshop is designed to put into practice ideas presented by Jones at the seminar on Friday evening. Both events are free. What has Buddhism got to offer in relation to the global crisis of capital? Ken Jones, a proponent of socially engaged Buddhism, offers a provocative analysis of the world economic crisis from the perspective of Buddhist teaching. His lecture on Friday night will be followed on Saturday morning by a short workshop aimed at showing how reflective practice can be integrated with social and political engagement. These events will be of interest both to Buddhists who wish to put their insights into practice in a social or political context, and to activists who wish to bring clarity of vision to their activities through reflective “inner work”. From Fri 10 June the weekly Rock & Roll Karaoke event in Dublin has a new home. After a long time in The Village, Songs of Praise have now moved to the Mercantile in Dame Street. And the new day for the Karaoke night will be Fridays from 23:00. Admission is free. *Graeme McKenna is playing an acoustic gig (Trad to contemporary) every Friday in the Maldron Hotel, Kingswood near CityWest from 19:00. * Need to wind down after a tiring week? Free Sahaja Yoga Meditation (not physical yoga, but “yoga meditation”!) classes every Friday at 19:30 at 4/5 Eustace Street, Temple Bar (next to IFI, ring bell no. 3) and every Monday from 19:00 in Blakestown Community Resource Center, Blakestown Way, Dublin 15 (next to Lidl). These are drop in classes, newcomers are welcome. For more information check www.coolspirit.info or www.sahajayoga.ie. The Dublin Dockland’s Summer Festival, organised by Waterways Ireland and the Docklands Business Forum, will take place this weekend. An array of activities, on both the land and water, are planned over the course of the weekend, culminating in the Waterways Ireland Inter-County Sailing Championship on Sunday, where sailing teams from all across Ireland will battle it out in a challenging and testing race around the docks. Between the racing, there will be an assortment of water based activities for everybody to partake in and enjoy including kayaking, paddle boarding, barge rides, viking splash tours, dragon boat displays, as well as the opportunity for the young and old to try their hand at a range of free and interesting water sports. If you prefer to stay dry you can sponsor a duck in the Barrettstown Rubber Duck Race (on Saturday) or play water golf off the jettie. Land activities will also on offer: With street performers, music, face painting and balloon modeling there to entertain. A gourmet food market will have a huge range of quality fresh and exciting food from across the globe, with everything from Greek and Japanese cuisine to a more standard European fare. Check out the individual events here www.docklandssummerfestival.com/map-programme/ Most events take place in and around the Grand Canal Square and the Grand Canal Basin. Sat 25 June: 10:00-12:00 + 14:00-16:00 – Tolka Valley Park (meet at the entrance at the junction of the Broombridge and Ballyboggan Road. Tolka Valley Park runs through Dublin’s western suburbs of Blanchardstown, Mulhuddart and Corduff. The park follows the course of the Tolka River to the Dublin City boundary at Finglas. Four times this year the “People’s Art 2011” exhibition will take place. It is an art exhibition on the rails/fence of St. Stephen’s Green. If you want to exhibit at one of the events in the future, check the website for cost and conditions. Visiting the People’s Art Exhibition is free. Specific start and end times are not defined, but exhibition space has to be occupied by 11:00, so 11:00 is the latest start time. The evnt runs from Friday until Sunday, but Sat+Sun will most likely be the main days. + Road to the Oscars Event – Fri 24 June 18:30-21:00. Booking required. A great programme and ALL for free! (But make sure to book were required!) Check out www.filmbase.ie/filmbase25/ for details. The Children’s Event “Pond Dipping” is a fun event exploring the weird and wonderful diversity of insects and minibeasts living in the National Botanic Gardens. Everything from tiny bugs to butterflies. This workshop is suitable for 8-10 year olds. Throughout the summer last year Fiona Moloney was running weekly Yoga classes to raise money for The Dublin Simon Community. It was a successful effort with EUR 1,600 being raised for homeless people in Dublin. Yoga in the Park is now back and will be run by Fiona and Tine Schnell. Each Saturday at 11:00-12:00 until September, Fiona and Tine will be taking turns to lead the classes. Meeting point is the Bandstand near the Zoo and near the Tea Rooms. Classes will be suitable for all levels and are donation based. That means you can give what you can afford, but please be fair. Fiona and Tine are doing a great job for the Simon Community and they need your support. Sat 25 June: 14:00 – Parnell Square to Civic Offices. The week-long Dublin Pride Festival comes to an end this weekend, but not before the biggest event takes place this Saturday. The Dublin Pride Parade starts at 14:00 at the Garden of Remembrance and then travels down O’Connell St, over O’Connell Bridge, onto D’Olier St, College St, Dame St, Lord Edward St, Christchurch and Winetavern St. It will finish up at the Amphitheatre at the Civic Offices on Wood Quay, where a Post Parade Party will start at 15:30. 20,000 people are expected to attend the Pride Parade! The Amphitheatre area has a limited capacity, so make sure you get there early. If you miss out on getting into the area itself, you can enjoy the show from the hill area outside Christchurch Cathedral. Among others, the following acts will perform Crystal Swing, Niamh Kavanagh, DJ Zack Hadley, Von Trash. In addition the winner of Pride Factor 2011, a pole dancing act, will perform and drag performers, including Lady Veda, Shirley Temple Bar and Victoria Secret will attend. After the Post Parade Party there will be more parties in a variety of venues in the City Centre. Some are free until a certain time and you can find the details in the programme here www.dublinpride.ie/events/programme A few more events will take place on Sunday and they are all included in the Programme on the Dublin Pride website as well. The National Bike Week is taking place from 19-25 June and as part of this a number of cycling and awareness raising events are being organised including a family leisurely cycle along the Metals in Dún Laoghaire on 25 June. All are welcome and encouraged to attend, but Registration is essential. This free event is organised by Dún Laoghaire-Rathdown Sports Partnership and Dún Laoghaire-Rathdown County Council, with a goodie bag, high viz vest and refreshments at the finish line for everyone. The route is 5km in length, starting in People’s Park, following “The Metals” to Dalkey, and returning along the Coast Road to finish again in People’s Park. The route is suitable for all levels of cyclist. Connecting Dún Laoghaire to Dalkey, the Metals route takes in some of the most scenic and historical streetscapes in the County and provides an attractive link for cyclists to DART stations, schools, recreational facilities and shopping. Henrietta Game will perform in Tower Records. * Don’t forget that the Temple Bar Markets (Food Market on Meeting House Square, Book Market on Temple Bar Square and the Designer Mart near Cow’s Lane) are taking place every Saturday from 10:00-16:30. The Food Market is – until June – divided in parts and distributed in different locations in Temple Bar. * Meditation through Breathing: Every Saturday from 11:00-12:00 this event will take place in Iveagh Gardens (at the back, near fountains). The event is free of charge, but since it is weather dependent, you are asked to call beforehand to ensure the class is on (087 2045168). Suitable for all. No previous experience required. Wear comfortable warm clothes and bring a yoga mat/light blanket. * Salsa/Latin Party in the Merchant Arch Bar, opposite the Ha’Penny Bridge from 23:00-02:30. Admission free. Sun 10:30-12:30 – Phoenix Park Visitor Centre. The weekly Children’s Art Cart Workshops is taking place every Sun. Up to 15 children (5yrs+) can participate but they must be supervised by an adult. The next workshop is on 26 June. The schedule at www.phoenixpark.ie/newsevents/title,12181,en.html doesn’t tell us what the topic is, but I am told that the workshop nevertheless continues. To confirm that it takes place and to find out this week’s title ring 01-6770095. The next Dublin Flea Market is taking place in the Food Co-op, 12 Newmarket, just off Cork Street, Dublin 8 on Sun 26 June from 11:00-17:00. The flea market takes place every last Sunday of the month. For more information or if you want to sell your own stuff, check out www.dublinflea.ie. The Co-op Hall is wheelchair accessible and lots of free parking spaces are right outside the door. The Flea Market extends to the outdoors area on Newmarket and features now 20 additional outdoor stands. “Urban Living is an interactive event which animates an urban space in the City Centre through performance and colour. This vibrant event maximises the use of Wolfe Tone Park, a key Dublin City public space in the heart of the Capital by animating it and transforming the space into a creative hub where visitors can relax, learn and be entertained by an engaging programme of music, circus and gardening workshops. Ireland’s top Circus performers Johnny D’Juggler and The Other Brothers, walk in Circus workshops, stilt walkers, face painting and the 24 piece Barbershop Troupe “Blue Heaven” will engage and entertain audiences young and old. The innovative, award winning landscape gardener Peter Donegan will preside over gardening demonstrations, sharing his thoughts and ideas on how to get the best out of our urban spaces including using quirky recycled household objects! The closing event for the Bike Week 2011 will be the day long Pedal in the Park event. Pedal in the Park is a fun, family friendly celebration of all things bicycle. Come along for the Bike Village where everything you ever dreamed of about cycling will be on display, Live Music, BMX Stunt Displays, Bike Rodeo, Bike Tours of the Phoenix Park, the Seven Man Fun Bike, The Gold Sprints Static Cycle Races, The Kid Zone, Face Painting, Balloon Modelling and much more. At 15:00 a Parade of Colours will pedal off for a 6km non-competitive bike cruise around the Park in a completely car free environment. All 32 counties will be represented. All are welcome to participate and wear their county colours. The Dublin Sketchers Group is an informal group of typically hobby artists who go somewhere different in Dublin every Sunday (e.g. Collins Barracks, Farmleigh, Botanic Gardens, Dublin Castle), sketch for an hour or so, and then meet up for coffee afterwards and discuss their sketches. www.dublinsketchers.blogspot.com/ Find out on their website where they will meet and join them if you do some sketching/drawing yourself. Meeting time is usually around 14:00. Sun 26 June: 15:00-15:45 – National Gallery, Merrion Square West, Dublin 2. Saucy Sundays is a live music session happening in the The Grand Social (former Pravda) near Ha’Penny Bridge. The next event will be on 26 June from 16:30-22:30. The line-up will be: Myles Manley, Cal Folger Daym Last Second Magic, Peter Doran, YFO, Agnes Latscha, Elliots Way. For all details check www.facebook.com/profile.php?id=100001494016795&v=wall to find out all details. * The Temple Bar Book Market is taking place every Sat+Sun on Temple Bar Square from 11:00-18:00. A free monthly film club is taking place at the IFI and the next event will be on Monday. Each month the IFI pre-selects three films, ranging from new releases to old classics, and then gathers for a discussion at the end of the month. In addition to this, three industry experts are on hand at each meeting to give their opinions on each of the films, before opening it out to the floor for a wider discussion. Up for discussion in June will be new releases Senna and Potiche, and Ivan Passer’s 1981 film Cutter’s Way. The panellists will be Access Cinema’s Manager David O’Mahony, IFI Cinemas Manager Peter Walsh and Chief Executive of Theatre Forum, Tania Banotti. Admission is free, but you need to book a seat. Contact the IFI Box Office on 01 679 3477 to book your seat and come along to join in the debate. The line up on 27 June is Lou McMahon, Water Woods & Mountain, Catherine Cunningham, Carlo Magliocco. The first three Mondays of every month the Solar Trio with guests, host a free improvised music gig upstairs in Anseo on Camden st. Creating their own unique takes on old jazz standards along with totally improvised on the spot jams. Expect swing and hard, deep grooves meshed together with post progressive and contemporary meandering sections. Tues 28 June: 18:30 – The Gate Theatre, Cavendish Row, Parnell Square, Dublin 1. * Live Jazz and Blues from 21:00 every Tuesday in the International Bar on 23 Wicklow Street, Dublin 2. NCI is hosting a free seminar where job seekers can find out how they can access jobs in cloud computing and find out about free places available on cloud computing courses. The event is called “Find your silver lining” and will cover the questions What is cloud computing? What is the scale of the opportunity and what does it mean for my career and job search? What are the job opportunities? Who is hiring and what are they looking for? How to transfer your skills and Package yourself for the cloud. If you are coming from a different occupation how do you transfer your skills to position yourself to get a job in the cloud? If you are an engineer, business graduate or architect what should you do to avail of these new opportunities? How do you position yourself in the new employment cloudscape? The seminar is free and no prior registration is required. The National College of Ireland is offering free places on certain part-time courses for the unemployed under the Springboard initiative. Advisors will be on hand to discuss which course is right for you and how you can avail of one of the limited places. Every Wed from 21:00-23:00, The Swing Factory (Paul Sweeney – trumpet, Neil McMahon sax, Bob Whelan vocals/keys Dave Fleming bass, Ian Hyland – drums) will be playing Jazz in O’Reilly’s Pub in Sandymount, D4. Admission is free. Thurs 30 June: 09:15-14:00 – European Public Space, European Union House, Dawson Street, Dublin 2. On Thurs 30 June, Temple Bar Cultural Trust will host the first of a number of Temple Bar Talks. The title is “Enhancing Ireland’s role in European cultural and creative industries” and the event will take place in the European Union House. Detailed information is available on www.templebar.ie/Event/Temple_Bar_Talks and for bookings contact Temple Bar Cultural Trust on 01 677 2255 or email Cicilia Lundberg at clundberg@templebar.ie. Thurs 30 June: 18:30 – You have to signup to find out the location. GIY groups are local food growers networks that recreate the camaraderie of allotment growing for back-garden vegetable growers by getting them together on a regular basis to learn from each other and exchange tips, war-stories and produce. The EYP (European Young Professionals) Dublin Summer Garden Party will take place in D Two. Check www.facebook.com/event.php?eid=180807235310458 for details about the event and more information about EYP can be found here: www.eypglobal.org/Dublin. To book your place, send a mail to eyp.dublin.ireland@gmail.com or confirm your attendance on the Facebook Event Page. 30 June: 19:00-19:30 – On your TV! Capital D, an RTE 1 (TV) programme in which Anne Cassin reports about events in Dublin, will be aired tonight and – if all went according to plan – it will have a section about the Dublin Event Guide For Free Events in it! If you are a Singer, Songwriter, play an Instrument or just want to jam then come to the Railway Sessions in O’Reilly’s every Thurs at 20:00 and showcase maybe a new song or a cover. All performing musicians will receive a complimentary drink. The event starts at 20:30. To contact the organisers: info@dublinsocialtv.ie An Indie-Rock Club starts immediately afterwards at 23:00. Admission free. WANNA BECOME PRESIDENT OF IRELAND? Are you tired of your job? Or have currently nothing to do? Just enter the competition for presidential nomination like everyone else! What is in it for you? A job for the next 7 years, a nice salary of around 250,000 per year, a good few cool trips around the world and your accommodation is sorted as well. Tempting? Just throw your hat in the ring! Currently it seems that everybody who thinks that he/she is brilliant is doing that. By my count, 15 people have expressed their desire to become the next president. Expressing your interest doesn’t mean much yet. To get nominated you have to be a member of a party if you want to choose the simple route (you could even quickly join a party that you never had much of an interest in! ), but every party will only select ONE candidate. Alternatively you can try it on your own. It’s a little more work that way to get your name on the ballot paper, but 6 out of the 15 are choosing that way. The President has no big political relevance in the Irish political system, but he/she is the representative of the country and therefore is the highest job in the country. At that position you would think that it should be an honour to be asked to be a candidate, i.e. deserving people should be nominated by others. But all 15 have chosen to declare their candidacy themselves. It seems that none of them was asked (Two were asked and declined!) and the question can be asked if any of the 15 is really qualified. Interestingly the election has not even been called (formally announced) yet. We know that the current President (Mary McAleese) will leave in October and therefore an election is probably taking place in July, but formally the nomination process hasn’t even started. MySURVEY – Get rewarded for taking part in surveys. You can make your opinion count AND at the same time get vouchers as rewards or donate to a charity! Copyright 2011 by Joerg Steegmueller.